Africa Off Grid Solar Lighting Market size was 7.8 million units in 2015 and is projected to expand at over 16% CAGR up to 2024. Increasing need to illuminate African remote areas along with reducing kerosene lamps use is anticipated to be key factor driving growth. Off grid solar lighting is preferred among for rural areas with poor electricity infrastructure due to its portability and clean energy and efficiency compared with other traditional lightning options. Over 590 million populations in the region have negligible electricity access, which includes over 460 million rural populations and over 130 million urban populations. In addition, large population segment is dependent on flame based Lighting, which is hazardous, produces low intensity light, and requires continuous fuel purchase such as kerosene. 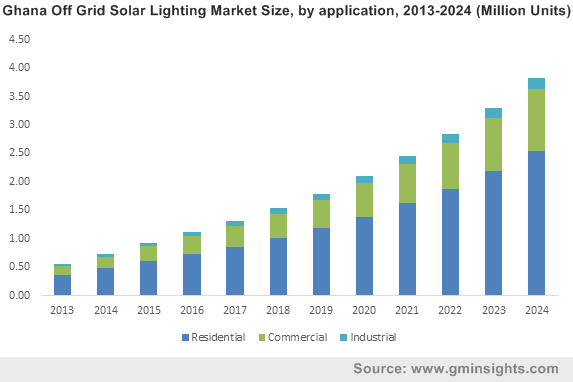 This is anticipated to propel off grid solar Lighting market growth in the region. Decreasing solar component prices makes off grid solar products cost competitive against traditional lighting source such as kerosene, candles, and others. In addition, on an average, 15% of family income in Africa is consumed by lighting expenses. Increasing solar off grid Lighting product use can help in minimizing annual lighting expense, and also helps in reducing health hazards issues related with conventional light source. Technological advancements have helped in offering extra battery life, multipurpose features such as mobile charging, and user friendly products is likely to boost Africa off grid solar lighting market size from 2016 to 2024. However, lack of customer awareness regarding available products may hinder industry growth. Kerosene lamps and candles together account for over 80% of lightning source in countries such as Kenya, Uganda, Rwanda, Ghana, and Tanzania. Also, kerosene lamps contribute over 270 kiloton black carbon emission annually, which is equal to 240 million tons of carbon causing global warming. Increasing kerosene price had led to kerosene replacement with clean energy source such as solar is forecast to positively impact industry growth. Solar Lantern System (SLS) product segment was valued at over USD 190 million in 2015. SLS offers sufficient illumination with low cost, large low income households in the region without electricity access is forecast to drive product demand from 2016 to 2024. Solar Home System (SHS) product segment to projected to expand at over 16% CAGR up to 2024. It offers added feature such as cell phone and small electronic gadget charging, penetrating cell phone use in every economic class is likely to drive SHS demand. Large Solar Home System (LSHS) is estimated to reach USD 110 million by 2024. The middle income group in developed African countries such as South Africa, with irregular electricity supply are switching to LSHS owing to its capacity to light 4 to 5 bulbs. Residential application segment was valued above USD 240 million in 2015. Kerosene lamp replacement with off grid solar Lighting products is forecast to be key driving reason for industry growth in residential application. Also, decreasing product cost coupled with health hazardous related to kerosene lamp is likely to complement growth. Commercial off grid solar lighting market is forecast to witness gains at over 16% CAGR. The product application can help in small scale businesses such as retail to add extra working hours in night, which may help to increase their sales. Industrial application is projected to touch USD 130 million by 2024. Off grid solar lighting product may support small scale industries with uninterrupted electric supply for smooth day to day business processes. Kenya off grid solar lighting market size was valued at over USD 85 million in 2015. Rising need to minimize Lighting expenditure in the country is anticipated to be key reason driving growth from 2016 to 2024. Also, technological advancements in providing low cost, up to five-hour battery life, and, portability may complement industry growth. South Africa is set to reach USD 65 million by 2024. The middle income population presence in the country may boost demand for LSHS product in the country, as it offers multiple lights & charging ports. Africa off grid solar lighting market share is fragmented with large number of local manufacturers. Key industry participants include SunnyMoney, Philips, and WakaWaka. Other notab;e industry players include BareFoot Power, D Light, Sun Tech, BBOXX, ASE, and Nuru Light. The product manufacturers have joined hands with local shop keepers to make their products easily available for customers. Also, manufacturers have started campaign to educate rural population and students about product advantage with use of abundant solar energy source. For instance, SunnyMoney solar lights collaborated with Artcaffé to educate students in rural Kenya about their solar products. Off grid solar product is designed to support remote infrastructure with electric supply for day to day activities. Increasing need for clean and economic energy source have made industry players to explore vast potential in African continent, with the focus to provide affordable and clean light source for low income population. Also, increasing awareness regarding health hazards related with kerosene lamps has drifted demand in favor of these products.